All I can say it was awesome. It reminded me of Kill Bill in it's pacing and structure. Though this is probably one of the most chronologically succinct of all of his movies to date. 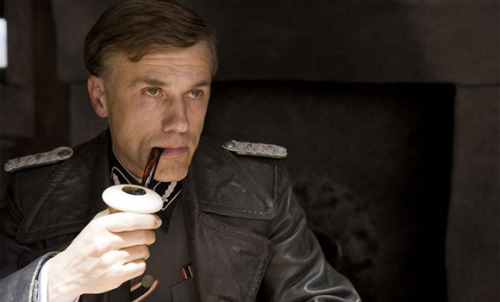 Christoph Waltz as Col. Hans Landa was absolutely incredible. He's a true sociopath, he has no feelings or empathy for the actions he's taken. He brings home the idea that the truest evil would be unrecognizable in a crowd. There is no doubt in my mind that he deserves an Oscar for his performance. It's also no doubt in my mind that the film will probably get nominated because anything to with the Holocaust always get nominated. My only complaint is that it does portend the viewpoint that all German soldiers were Evil Nazi Jew Killers. Most German soldier were just that soldiers. They were fighting for their country as asked. Most were not Nazi's most didn't even know about the Holocaust until after the war. Now they were complicit in the institutional racism that existed in Nazi Germany, so there is a bit of "Guilt by Association" in that respect. Overall though it's not a huge deal for me, it's a movie, but we all know there are some dumb and gullible people in this country who have absolutely no knowledge of History beyond their own birth. Case in point a retarded girl sitting three seats down from me who didn't know how to whisper asked her boyfriend "Why did he shoot them?" when the German Soldiers killed the family hiding under the floor. I mean really? Hatsune Miku Performance Method Revealed!